Put the flour and a pinch of salt in a food processor; add the butter and blitz until the mixture forms coarse crumbs. Tip out and mix in the cinnamon sugar. Peel, core and slice the apples into a large saucepan. Peel, core and roughly chop the pears, and add to the pan. Add 2 tbsp water and the caster sugar. Bring to a simmer and cook gently for about 10 minutes, stirring often, until the fruit starts to soften. Take the apples and pears off the heat. 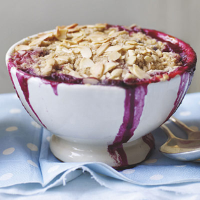 Stir in the frozen fruit, then tip into 8 small ovenproof bowls or an ovenproof dish about 20cm x 25cm x 5cm. Top with the crumble mixture and scatter over the almonds. Bake for about 30 minutes until golden and bubbling. Serve with cream.